Now that the Mira Vista remodel is moving into “phase two” (aka – the downstairs), I’ve been poking around and looking at different kitchens for inspiration. We’ve come a long way from the days where the kitchen was tucked away, unseen by public eyes. Now it’s often a showpiece (as well it should be!). I believe that the kitchen is the heart of the home. A place for friends and family to gather, find comfort, community, and some good food! 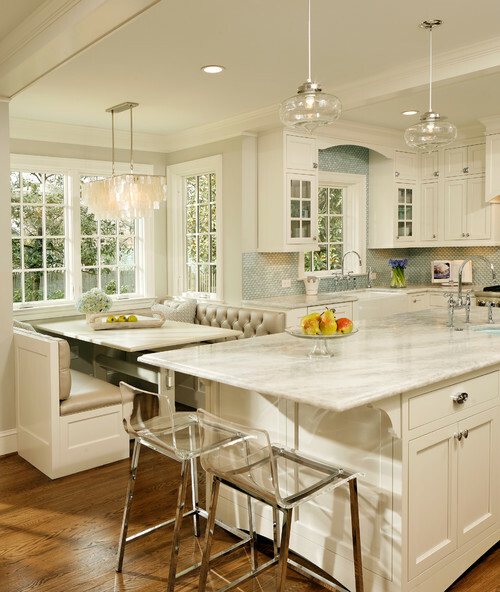 Traditional Kitchen design by Dc Metro General Contractor Harry Braswell Inc. I love the light and airy feel here, as well as the surprising contemporary twists that keep this space fresh and not too traditional. Contemporary Kitchen design by Dc Metro General Contractor Nash Construction, Inc.
I’m a sucker for something unique and unexpected. The contemporary style is perfectly balanced by warm tones and vintage-styled pieces. Striking high contrast. Amazing ceiling detail! Great play on light and depth. 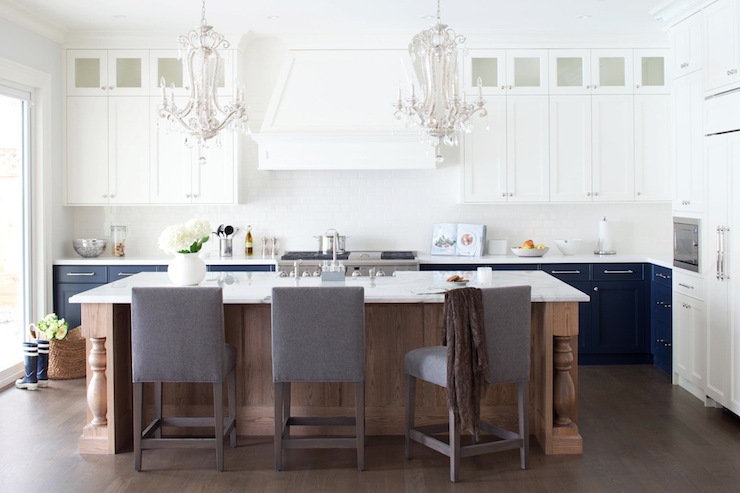 I love the unique materials used, especially the basket weave backsplash and the pendant fixtures that add just the right amount of sparkle. I would have this kitchen in my home! 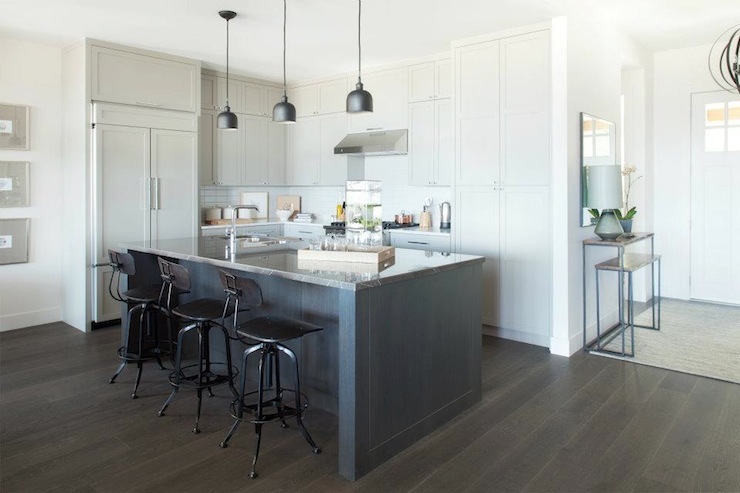 The luxe fabric barstools, charcoal gray tones, streamlined cabinetry… the list could go on and on and on. Did I mention the sliding barn door and mid-century style dining chairs in the background? Love, Love, LOVE! Contemporary Kitchen design by Philadelphia General Contractor Hanson General Contracting, Inc.
Great way to incorporate texture through the unfinished wood ceiling. 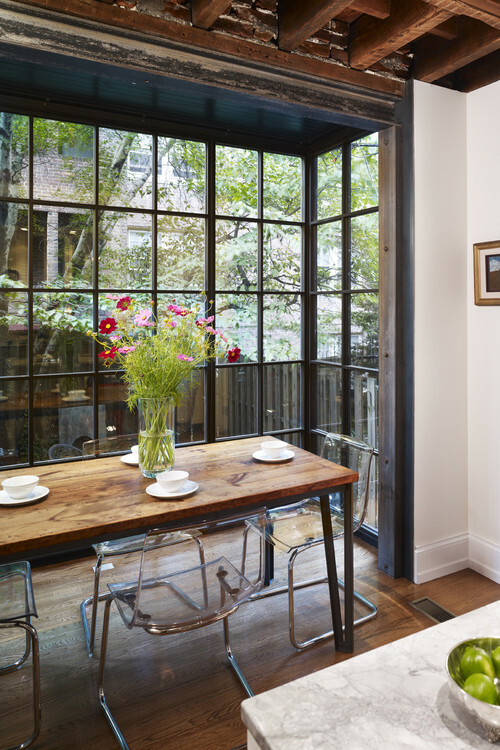 I love the contrast and character of the space. Unique and livable. 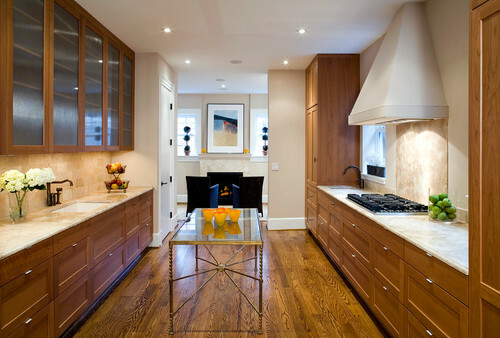 Love the warm, creamy tones of the cabinets and floor. And an amazing island shelf! Minimalist with an industrial touch. I love these barstools! How fun is this?! An eclectic mix of texture and style. 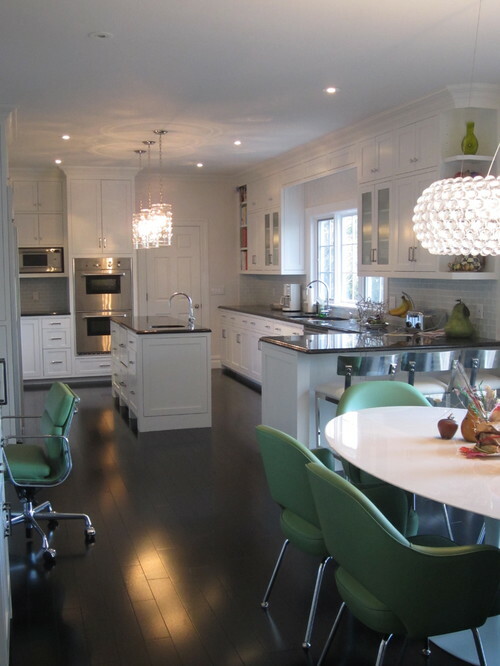 The difference in the island and surrounding cabinets are balanced by the unity of white from the countertop upwards. The shape of the chandeliers also gives visual rest to the strong vertical lines. I love this! 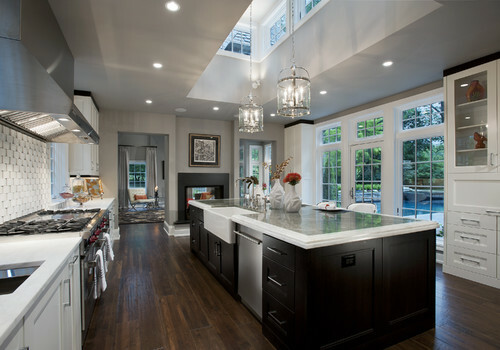 These are fabulous kitchens. I think I’m more partial to the ones with the wood and the green. I love the bright contrast.